I am a senior engineer at Salient Process who exclusively works on the IBM Business Process Manager and related products. Over time, I have built and collected information related to the use of these product which I have found to be of value to users, potential users and fellow colleagues. This page presents access to my personal notes, links and other related items that I feel may be of value. As I learn an IBM product, I take copious notes and jot down thoughts. I have bundled these together into book format and now make it available as a PDF document available for free download. The book is released once a month (normally on the 1st day of the month) so it is a good idea to bookmark this page and check back regularly. 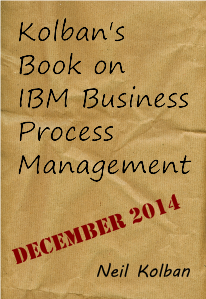 For questions not related to the book, please post these to the IBM developerWorks forum dedicated to IBM BPM.